As we predicted earlier today the Shark destroyed Adam "Big Donkey" Dunn by personally robbing him of a home run and keeping the game at 0-0. Some people have been questioning the origin and motives behind "The Shark" nickname. I hope this catch helps put those questions to rest. 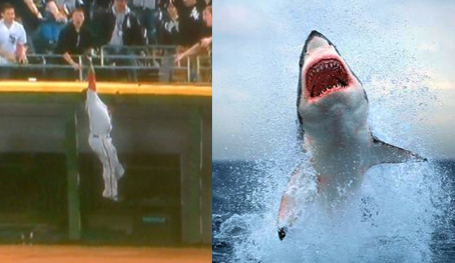 Bernadina moved through centerfield as sleekly as a great white shark moves towards his prey. He majestically leaped over the fence like a powerful Great White emerging from the deep blue into the open air and caught the ball as easily as a Shark swallows a minnow into his gaping jaw. Excuse the flowerly language, but that catch was just that sweet. Just another day for Bernadina as The Shark. Shark got off to a rough start offensively, but finally got going in the 8th inning. He got on base with a bunt, promptly stole second, and moved over to third on the Loch Nix Monster's ground out. Then Mako Morse stepped up to the plate and engaged Beast Mode. He hit a blast to CF to put the Nats up 2-0. Things got crazy in the bottom of the eigth, Mako Morse stretched for a ball then tagged the runner who was called out. The home plate umpire then REVERSED THE CALL. Interm Manager John McLaren did not like that and argued it LIKE A BOSS. He got thrown out, but that wasn't enough, JERRY Hairston got fired up and was ejected too. I wrote that in the 9th inning when I thought the game was almost over...boy was I wrong. I'm not going to recap all of the back and forth drama of the 9th-14th innings, but needless to say, it was an exciting game and Shark had some great hits. Brian Bixler really was player of the game and cemented his nickname as "Speed Racer" (be sure to tweet it to Bill Ladson).